Marc Marquez's MotoGP dominance will come to an end in 2019, according to former rider and television commentator Neil Hodgson. Marquez has been a revelation since stepping up to the top level of motorcycle racing in 2013, winning 44 grands prix on his way to five championships. 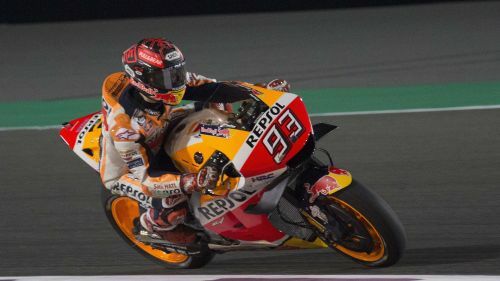 He made it three in a row last season as he cruised to the title by 76 points from Ducati's Andrea Dovizioso, the Repsol Honda rider winning nine of the 18 races. However, the Spaniard suffered a number of shoulder dislocations across the campaign and underwent surgery in December, limiting his running during pre-season testing. And Hodgson believes the 26-year-old's recovery and an underperforming bike means he will struggle to retain his crown in 2019. "It's going to be closer than it was last year, which is hard to believe because last year – actually the last three years have been the best we've ever seen," Hodgson told Omnisport. "This year, again, is going to be better. "And I think the good news going into the start of the season is that the Honda is not the strongest bike and Marc Marquez isn't 100 per cent fit. "The last six years I've said, when asked, Marquez [will win the title] but this is the first year I'm going to say I'm not putting him as favourite going into the season, which is exciting. "I'm going with Dovi [Dovizioso], he's the strongest rider and package going into the start of the season." Último entreno antes de la primera carrera! Hodgson added: "The problem with a shoulder injury is that it is not like when you break a bone. When you break a bone they put a pin in it and within two weeks – there's [still] pain but you can bounce back and it's just as strong. "When you've got an injury like the shoulder, it's a delicate part of the body, it's the most complex joint of your body, I know because I ended my career with a shoulder injury. It's horrendous, and if you rush the rehab, the tendons he's had reattached, you can pull them off and have a right mess on your hands." Marquez's team-mate at Repsol Honda this season will be long-time rival Jorge Lorenzo following his departure from Ducati, but Hodgson believes the latter may come to regret his decision. "Yeah, definitely [he should be questioning the decision to leave Ducati] but that was done before Jorge really figured out the Ducati, so it made sense," he continued. "But within a month it was apparent that it probably was a mistake to leave Ducati. "It looks like Ducati is the best package overall, they've got speed, experience with the electronics. "It's taken all this time but Ducati have built such a strong team and motorcycle, and because of that they are the number one manufacturer this season. I'd say second is joint with Yamaha and Honda."